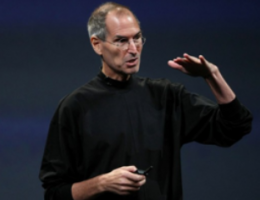 By Daemon Mailer, SAN FRANCISCO – Just like you and me, Apple head honcho Steve Jobs took a fresh body blow yesterday from the news of increased turmoil in the Middle East. With flotillas and vuvuzelas threatening to end the the world’s diverse peoples before we can ride the wave of globalization, etc., is there any news for hope? The Brutal Times flew me to sunny San Francisco to sit down with Jobs and pick his brain re presentation prowess. DAEMON MAILER: Steve, it’s a pleasure to meet you. I hear you had dinner – lunch – with the President. DM: So, how’d that go? Did you feel like you were selling out? I know after Eazy-E did that, with Bush, you know, Ice Cube kind off sounded off on the whole thing. Has anybody kind of …rained on your parade? DM: Ah- hah. So, what is it about your presentations that makes them so great? What do you do in the boardroom when all of us are sleeping to really go the extra mile and clinch the bronze? This entry was posted in Highlighted Brutality and tagged a fresh body blow, apple, bush, daemon mailer, Eazy-E, flotilla, globalization, Ice Cube, stev jobs, steve jobs' perfect presentation secrets, the brutal times, turmoil in the middle east, vuvuzela. Bookmark the permalink. I searched for ‘vuvuzela’ and I got this. Thanks, guys.